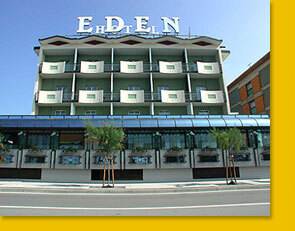 Hotel Eden, located in an ideal position in the centre of Grado, the Island of the Sun, is a modern hotel, which has constantly kept up with the times to meet the comfort and quality required by its many guests. The hotel, which has an exclusive panoramic view over the lagoon of Grado, is in the centre of the island where all the tourist facilities are concentrated. In fact, just a few steps away is the entrance to the beaches, the Terme Marine health spas, the thermal swimming pool, Parco delle Rose, mini-golf, tennis and the port. The comfortable rooms offering all the latest commodities and facilities, the personnel who is at your complete service and the excellent cuisine, the possibility of excursions to visit the surrounding places that have a historical-cultural interest and the uncontaminated nature of the lagoon will make your stay in Grado unforgettable.